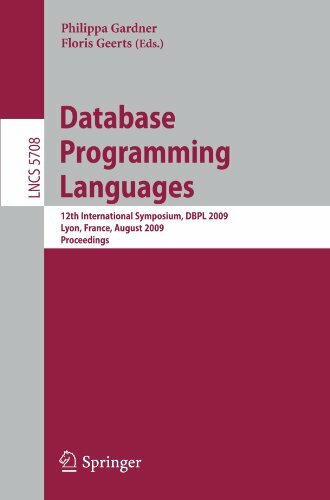 This volume contains the proceedings of the 12th International Symposium on Database Programming Languages (DBPL 2009), held in Lyon, France on - gust 24, 2009,and co-locatedwith VLDB (the International Conference on Very Large Data Bases). DBPL continues to present high-quality work at the intersection of database and programming language research. This proceedings volume contains the six papersacceptedforDBPL2009,whichwereselectedbytheProgramCommittee. Every submission was reviewed by at least three members of the committee. In addition, we sought the opinions of external referees, chosen because of their expertise in a particular topic. We would like to thank all the authorswho submitted papers to DBPL 2009. We also thank the members of the Program Committee for their excellent work during the electronic selection meeting. We are grateful to Andrei Voronkov for his EasyChair system, which made these discussions comparatively straightf- ward. WewouldliketothankMarceloArenasandMichaelI.Schwartzbachfortheir assistanceandsoundcouncilasProgramChairsofDBPL2007.We?nallythank Mohand-Said Hacid and Jean-Marc Petit for their superb local organization of DBPL 2009.